This post features a breakfast that Wilson and I made over the summer. It’s a breakfast that perfectly fits into the personality of summer or spring. These crêpes are cheerful and light – filled with generous amounts of whipped cream and fresh strawberries. While we love pancakes, crêpes have a way of showcasing the toppings in a different way than pancakes do. In the fall or winter, pears or sautéed apples would also be wonderful. Crêpes are a pretty romantic breakfast. I’ve heard men instructed to fix crepes for a woman he’s trying to woo. Although I don’t like the idea of bribing your significant other with food, I will admit that crêpes are a pretty persuasive option. They’re more delicate than most foods, and it’s good to see a man unafraid of his softer side. No one will be enchanted by a man who has to have his steak or bacon – too hyper-masculine… too meat head! Anyway, we didn’t really fix crêpes to be romantic. We just thought they would taste good! This was Wilson’s first time having crêpes and he loved them. Although traditionally crepes are made on a special “crêpe-maker” which is basically a flat, rimless skillet where the batter can be fanned out, we just used an ordinary skillet. They were remarkably easy to make – and trust me, very easy to eat. 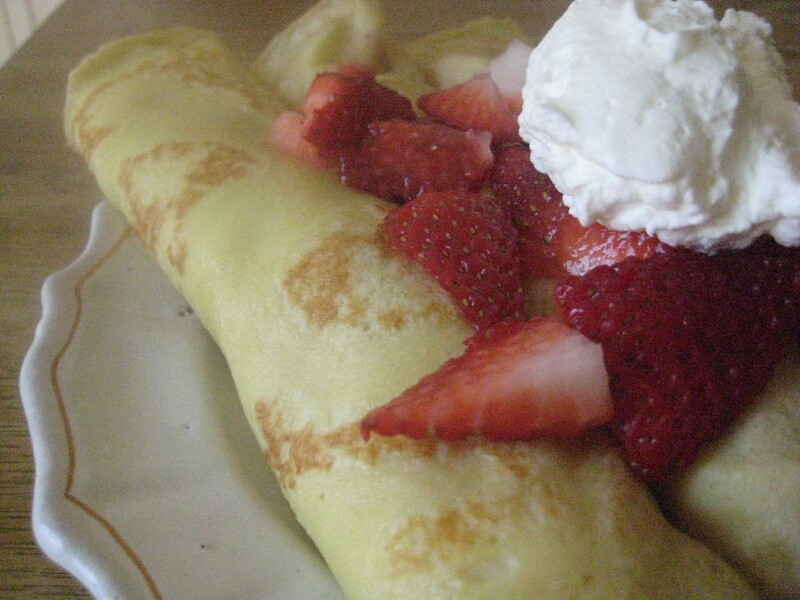 I made the crêpes themselves while Wilson whipped the cream and sliced the strawberries. This was a really enjoyable dish to make together, requiring lots of teamwork and tasting. We nibbled on strawberries, dunked them in whipped cream and rolled up the first crêpes for a taste-test – all before actually sitting down to our breakfast. 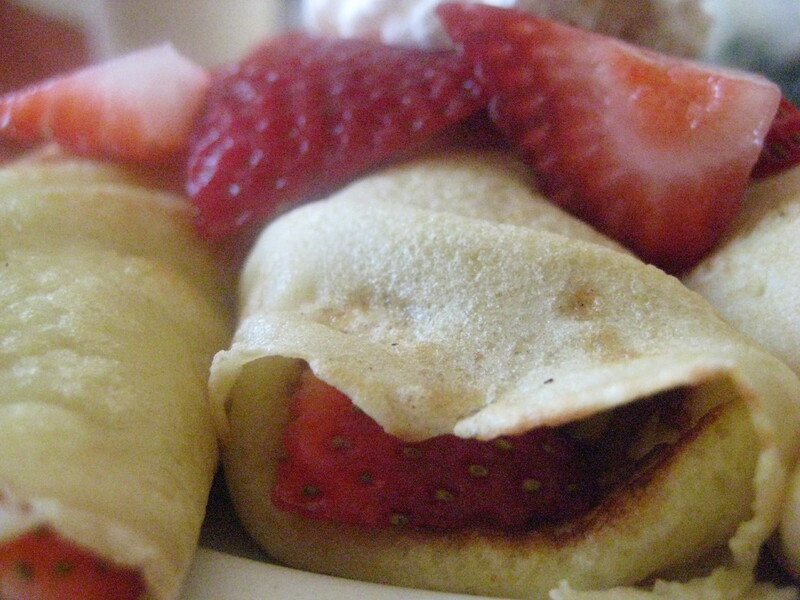 The strawberries are a bright, tart contrast to the richness of the crêpes and whipped cream. The crêpes themselves are delectable, and serve as tender, slightly sweet parcels for all of the berries and cream your heart could desire. Enjoy them for a romantic breakfast or when you just want something tasty that will put a little flush in your cheeks! Pour the milk, melted butter, eggs, sugar, and salt into a large mixing bowl. Whisk together. Add the flour and whisk until smooth. Refrigerate the batter for at least 1 hour. (The batter can be made in advance and refrigerated overnight). When you’re ready to make the crêpes, let the batter come to room temperature, then whisk it to think it out a bit. Heat a 12-inch nonstick skillet over medium to high heat. When a few drops of water sprinkled on the pan sizzle, pour 1 /4 cup of batter and quickly tilt the pan so the batter covers the bottom. Cook the crêpe for about 45 seconds, until the edges begin to darken. Use a flexible spatula to flip it over, then cook for another 45 seconds on the reverse side. Serve with whipped heavy cream (slightly sweetened) and fresh sliced strawberries. And thanks for stopping by http://www.thegalleygourmet.net/. Savory crepes sound wonderful… perfect for any meal really. Maybe I’ll make some soon!